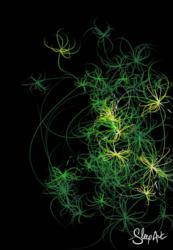 'Sleep Art’, the app, creates a virtual painting of your sleep from movement and sound. Ibis, the hotel company that brought hotels the ‘buttock-shaped plunger test’ and the ‘human roller test’, today brings the latest innovation in sleep technology. As National Bed Month kicks off, Ibis, the leading economy hotel, has created the Sleep Art app available to download free on the app store today. The Sleep Art app, available for new generation iPhones and the iOS 5 and 6 operating systems, captures movement and sounds from the users night’s sleep and converts this data into virtual brush strokes so that when the user wakes their sleep is a work of art. It is fun, easy to use and designed to create a ‘happy sleep’. To start the app, the user sets the alarm clock and plugs in their iPhone before placing the iPhone on the mattress. As the user sleeps, the app runs throughout the night recording the sounds, movements, vibrations and senses of sleep through the app’s motion sensor. The sleeper is woken by Sleep Art’s gentle alarm clock music and discovers the work of art produced by his/her night’s sleep. Users can chart their picture’s progress minute by minute on the screen to see how the art was created during the night. The art is stored in a virtual gallery so that users can compare each night’s sleep and share with the friends and family via email or Facebook. Ibis will be the first economy hotel chain to offer an entertainment app but it is not the first time that the hotel group has developed a product for sleep. Last year, after months of ‘buttock-shaped plunger testing’, ‘human roller testing’ and a sea of experts including doctors, sociologists and ‘bed boffins’, Ibis launched the Sweet Bed™ by ibis - specially designed bed and bedding - to ensure a happy sleep for guests around the globe. The Sleep Art app is the virtual realisation of the Sleep Art robot created for Ibis by ACNE in November 2012, which painted live art works following a motion sensor monitored night’s sleep in a specially created bed that toured across Europe. With the creation of a new bed, nation-wide refurbishments of UK hotels and creative innovations in sleep art, Ibis is leading the way in the budget hotel stay. Search for a hotel today, in a variety locations, London, Paris or maybe Amsterdam. Thomas Dubaere, SVP Ibis Northern Europe, "A happy sleep is at the heart of the Ibis customer experience. It is a key pillar of the Ibis megabrand revolution. We have rigorously investigated what ultimate comfort means for our guests and so invested in unique beds to change their sleep experience. "For example, in the United Kingdom and India guests prefer “soft” beds, so in these two countries we used spring technology in the new Sweet Bed by Ibis. The use of springs dates back to the 19th century when the UK’s rapid industrial development enabled the mass production of beds at a time when the chemical industry was less advanced and did not use foam technology. "The Sleep Art app aims to bring a bit of entertainment to peoples’ night’s sleep wherever they nap and shows that Ibis can give the best sleep in the economy segment."